The Library and SAGE publishers would like to gain a better insight into the resources you use as part of your academic studies – from books, videos, websites, social media, and everything in between. 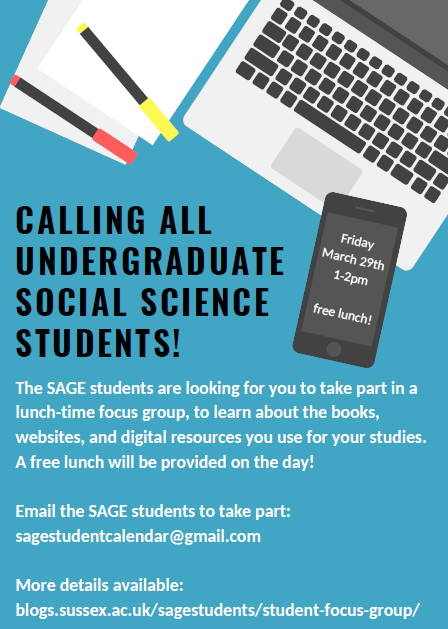 We are running a focus group on Friday March 29th 2019 from 1-2pm, and need students to participate. A complimentary lunch will be provided as a thank you. You can read about last year’s focus group here. To participate, please email your name, degee/subject and undergraduate status (i.e. 1st year, 2nd year, final year) to: sagestudentcaldendar@gmail.com.